ROMERO-BARCELÓ, Carlos A., a Resident Commissioner from Puerto Rico; born in San Juan, P.R., September 4, 1932; graduated from Phillips Exeter Academy, Exeter, N.H., 1949; B.A., Yale University, 1953; LL.B., University of Puerto Rico School of Law, 1956; practicing attorney, San Juan; mayor of San Juan, 1969-1976; member, board of directors, U.S. Conference of Mayors and National League of Cities, 1976; president, National League of Cities, 1976; president, New Progressive Party, 1974-1985 and 1989-1992; Governor of Puerto Rico, 1977-1985; chairman, Southern Governors Association, 1980-1981; Puerto Rico senate, 1986-1989; elected as a New Progressive to the One Hundred Third Congress for a four-year term and reelected to the succeeding term (January 3, 1993-January 3, 2001); caucused with the Democratic Party; unsuccessful candidate for reelection to the One Hundred Seventh Congress in 2000; is a resident of San Juan, P.R. 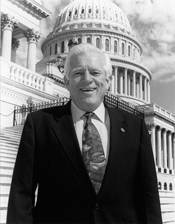 Carlos A. Romero-Barceló in Hispanic Americans in Congress, 1822-2012. Prepared under the direction of the Committee on House Administration by the Office of the Historian and the Office of the Clerk, U.S. House of Representatives. Washington: Government Printing Office, 2013.